I had seen Matilda a few years ago and since then I had been meaning to return. I finally got the chance on Wednesday night. 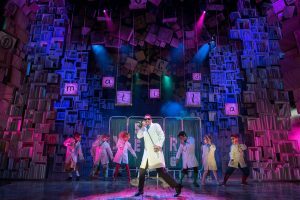 Matilda is based on the Roald Dahl book which tells of the young girl Matilda. Matilda is mistreated by her family and finds refuge in the world of books. It isn’t until she starts school that her teacher Miss Honey realises just how special she is but Miss Honey and Matilda have to battle Head teacher, Miss Trunchbull for them both to realise their full potential. 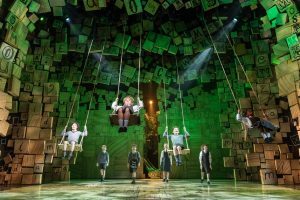 The story of Matilda has been adapted beautifully for stage and seeing the action unfold live before your eyes adds to the power of the tale. This is also helped by the utterly fantastic cast that play each role. The night I saw it Oliver Brooks was on for Miss Trunchbull (normally played by Craige Els). I would not for one moment have known that he was the understudy from his performance. He embodied Miss Trunchbull and by the end I had a strong feeling of repulsion for this character, clearly meaning that Brooks had done his job well! Abbie Vena took the title role on the Wednesday night. 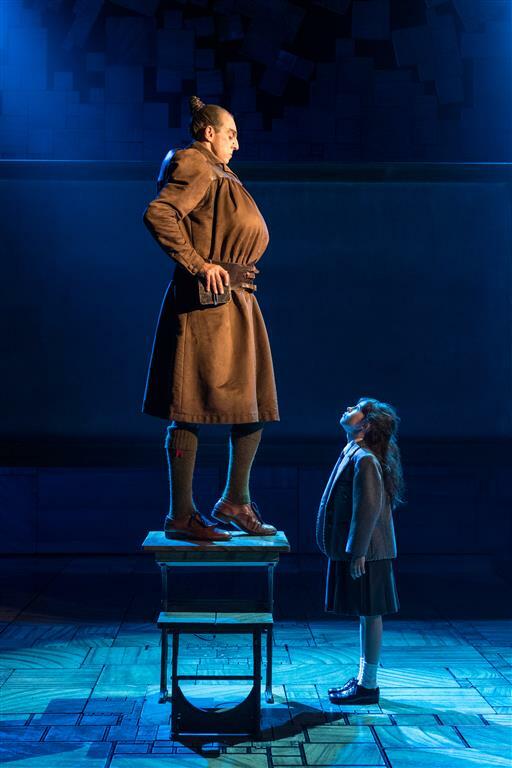 I am often in awe of child performers, especially in roles as huge as Matilda. Her strong, clear voice shone and every move was crisp and precise. She skilful steered away from precocious and captured the mix of Matilda’s vulnerability and her sheer intelligence well. I could sing the praises of all the cast with Miria Parvin as a warm Miss Honey, the Wormwood family causing my blood to boil along with much hilarity within moments of each other and the ensembles’ performance being slick and brilliantly drilled. The choreography of this show is one of the aspects of the show that I adore the most. The School Song is remarkably clever and shows how a simple concept such as using alphabet building blocks can be enhanced with a great combination of clever set design, talented and precise dancers and of course original choreography. ‘When I Grow Up’ is also something to behold with the cast performing on giant swings, coming out over the audience. Each number presents the audience with a different choreographic element and consequently the interest remains high throughout the whole of the show. The show is revoltingly good and one that captures the heart of the children and the children at heart in the audience. If you haven’t been to see Matilda yet I would urge you to get yourself to the Cambridge Theatre. A new cast have their first day at school on the 12th September however this current cast show no signs of slowing down and is a cast I would wholeheartedly recommend trying to see before the cast change. You can find out more about the show on their website. If you liked this review you may also like my reviews of 42nd Street, School of Rock and Dreamgirls.